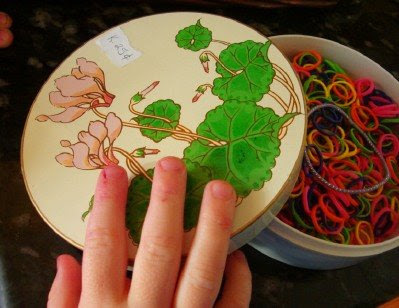 Like Merchant Ships: Best Place To Buy Hair Elastics? Best Place To Buy Hair Elastics? I need your advice on hair elastics. Where do you find the best quality for the best price? Beautiful box! I get the Goody cpn off coupons.com. Then I pick them up @ Target for free or real cheap. My daughter likes the plain black covered bands. I get mine mostly at Walgreens and CVS when they are free. About a month ago Goody Bands were free with ECB so I picked up several sets then. Winn Dixie (grocery store) had a pack for a dollar that came with a free clip on watch. Good quality. I will never buy them at the Dollar Tree again. They are not as tight and they tear up. I've taken to buying the all black ones too. They blend in the hair and match everything. I keep our ponies in a tin box that I got my Fossil watch in. I've always kept those little tin boxes and had no reason for them. Now I have one for ponies, one for clips and one for decorative ponies that have things attached to them. Great for travel. Just pop the tin of ponies and a brush in the bag. I usually just buy the black rubberband-type ones and Walmart because I sometimes cut them off when we take out the pigtails. My girls have super sensitive heads and while getting the piggies in usually an ordeal, getting it OUT is much, much worse. I just bought a package of small fabric covered pony tail holders in the little girls section of Wal-Mart. The "ouchless" ones seemed to be tearing up my little girl's hair - these do a much better job. Affordable? Not sure how much they cost but so far they're worth it for ease of use. Sally Beauty Supply seemed to me to be cheaper than Target/Wal-Mart. Not sure if those are everywhere. I have not tried quality, but usually their products are higher end than box stores. Walgreens mostly, since they usually end up free. Walmart otherwise. We use lots of them every day (fairly intricate hair *designs*) and usually cut them out to save ouches and time. I use the silicone ones that don't get stuck in my curly hair. I get them from Dollar Tree. I believe you get 100 in a pack. I also vote for Sally's! You can get a giant bag of elastics really inexpensively. I keep black and clear on hand for my girls and will occasionally buy one of their packages of colored rubberbands. They don't really last for multiple uses, but I prefer to cut them out of my girls' hair anyhow, so I'm happy to use a new one each day. Also, while probably not cheap, Curlformers are heaven-sent in my opinion. I have purchased several sets for my daughters over the past year and they're worth every single penny. They're incredibly durable and easy to use and make even a hair-novice, such as myself, look like a pro. I would bet that you could trade for a Sally's coupon with someone - they're sent out to frequent shoppers each month. Also, there are lots of really good bloggers out there who dish up hair tips for little girls. They're super fun! I have several of them listed in my favorite blogs. i am in agreement with renee9558. they make colorful versions of those same bands (the thick, no metal ones last longest). walgreens carries them inexpensively, too. ours are stored in a glass jar, with a lid topped with cute, freecycle contact paper. i love seeing all the colors! bonus has been my toddler playing with them while i do my daughter's hair! If fine or slippery hair is an issue, I love the Goody ones with the rubber wrapped around them in a spiral. I don't know what they call them, but they have the same thing on their headbands too. They do a good job of keeping hair in place, especially with a lot of activity. A little more expensive than the plain ones, but worth it! Well - 1 dollar. lol! way too expensive in my opinion. I don't buy flimsy thin little hair ties anymore. My girls have thick hair (Miss Mischief has a rope for a braid!). I get mine in my local supermarket ~ they are the same kind that school uniform shops sell in school uniform kinds of colours. No metal 'join' pieces, just thick heavy duty ties that come in different colours. If I lived in the US I'd give you a brand and a store, but we don't so I can't. Wow! Good deal on the hair ties. I did a deal a little while back at Walgreens to get a bunch for free--they carry them at Target for a good price though. My oldest daughter has super thick hair so I use Goody ouchless bands. For my youngest daughter's hair, I use Goody ouchless rubberbands. Her hair is pretty fine so they stay in really good but then slide out smoothly at the end of the day. Hope that helps! We keep ours in one of those little paper boxes from the dollar store. I like the silicone ones for my hair and for Emily's hair. They stay in better. I wouldn't say they are necessarily as durable, but I love that all of our hair stays in place. I highly recommend them!! I hate to say it...Walmart. They come on a ring with protected ends that holds a TON and I keep on a small hook. Like the others, I wait for them to be free or almost free. And I don't know what your experience is, but mine is that I find them ALL over the house and yard, despite warnings and consequences. So now I only buy black. That way we are certain to have a band that goes with every outfit. When holiday items go on clearance at 90% off, I buy girl gift bags for less than $1. These have lots of hair accessories, including hair ties. I keep all the hair ties. Then I use the bag for gifts later. I've bought Peeps gift bags for $0.30 this Easter at Target. Goody brand. Solid black or solid tan per the teenage girls in the house. When I used to buy the little ones, I tried the Goody brand but I like the Seventeen brand better. They stretch better! I don't know if they still make them, but I could only ever find them at Walgreen's. Good luck! I buy the plain black ones at Dollar General. I beleive I pay around $1 for 30 of them. Between my daughter and I I usually buy about 1 pack every 3-4 months or so. We get the 600 ct pack of silicon ones found in the health and beauty section for $2.95. This is for the kids, for simple pony tails or pulling back the top of their hair. For myself, I have extremely thick hair and need the kind that run about $4 for 3, but those last me a very long time. Thanks for asking the question Meredith! I need to buy some for my girls and it has been so long since I bought them I didn't know where to get the best deal/ product. Lots of great advice in the comments! Our bands are NOT frugal, but they are SO functional...my daughter and I keep up with them pretty well b/c they are expensive, but SO worth the cost...the SCUNCI brand at Wal-Mart w/ the NO-SLIP GRIP work perfectly. Dd's hair is thick and heavy; mine's thin and light. This type works best out of all the brands and sizes. Meridith I just got some bamboo soft hair elastics at our local Dollar Tree. They are fairly thick and have worked great for us and of course the pruce is ok with me!